One of the biggest hurdles to overcome in a lot of organisations is getting started with early customer validation. But it’s not so much an organisational issue, it’s mostly a personal issue. Do you have what it takes to get out and talk to potential customers? When I speak about innovation at conferences or workshops, I always ask my audience how much time passes between having an idea and discussing it with a potential customer for the first time. It’s usually many months. Even with audiences of a few hundred, I can always count on one hand the number of people that go out and talk to customers within the first week. All those weeks or months that pass by, where you are working on your idea (just thinking about it or discussing it with colleagues also counts!) are potentially a waste of time and probably inefficiently spent without any real customer feedback. The consequence? Still too many failures because of a lack of understanding of the real problem, or the lack of a problem at all. 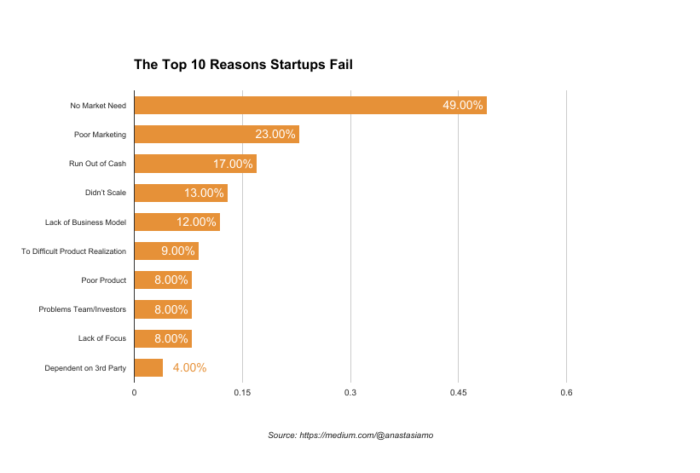 In a study of over 100 failed startups, the one main reason for failure with both B2B (44%) and B2C (50%) startups was a lack of market. One of the reasons that it makes people uncomfortable to discuss their ideas publicly early on, in my experience, is the fear of coming across as a silly person. “It’s obviously a bad idea, didn’t you think it through thorougly first? ?” We have the tendency to try to analyse things up front in a lot of detail, to ensure we come out with something “decent”. Hey, a lot of use are analysts, right? This puts pressure on the first customer contact. No one wants to make a fool of himself in front of a customer. Ironically, the solution is to go out and talk to people sooner rather than later. The longer you wait before your first customer contact, the more correct you’ll have to be. On the other hand, sooner in the process of developing an idea, you will be forced to ask questions that are more open, because you haven’t had time to figure out the details yet. You won’t be asking “Would you like to use geo-location in a loyalty card app to alert you when you’re near a shop you visit regularly?”, but rather “How do you typically deal with loyalty cards while shopping?” If you’re worried about negative reactions, such an open question is safer, as it’s not about opinions. It will also get you very relevant information that you’d miss out on if you lead your customer towards a specific solution right away. It helps putting you into listening mode, which is essential for great innovations. Open questions like this also pose little risk for organisations, which for example may be concerned about their brand image. By starting sooner with talking to customers (and repeating frequently), you’ll quickly get used to it. It will start to feel natural after a few times. Just like most new things become comfortable habits after repeating them a for while. Take a colleague or friend with you. It can be less stressful if you’re not alone. Start in a safe environment. For example, for one project, we did our first survey internally in the organisation. You do not need to prepare a full customer interview. Just one or two open questions are enough to get the conversation going. At this stage of idea development, you’re after a plain conversation, not a detailed analysis. Have nothing more to say after two minutes? That’s just fine as well. Google for networking tips on how to start a conversation, if that’s something you find awkward. Of course, simply saying “Hello” often does just fine. So don’t just think that early customer validation is something that is not accepted in your organisation. Find a safe and comfortable way for you to start with it, and show your organisation that it’s valuable and risk-free. The truth is out there. It’s up to you to get outside and discover it! How soon do you get out of the building? Do you have your own tips? Want to share some experiences of customer contact that went well, or that failed completely? Share them in the comments! Want to learn more about how to approach customer validation and where it fits in the idea development process? Follow my free webinar for blackmetric on June 7, where I’ll also talk about other tools and techniques for developing innovative ideas and performing customer validation.